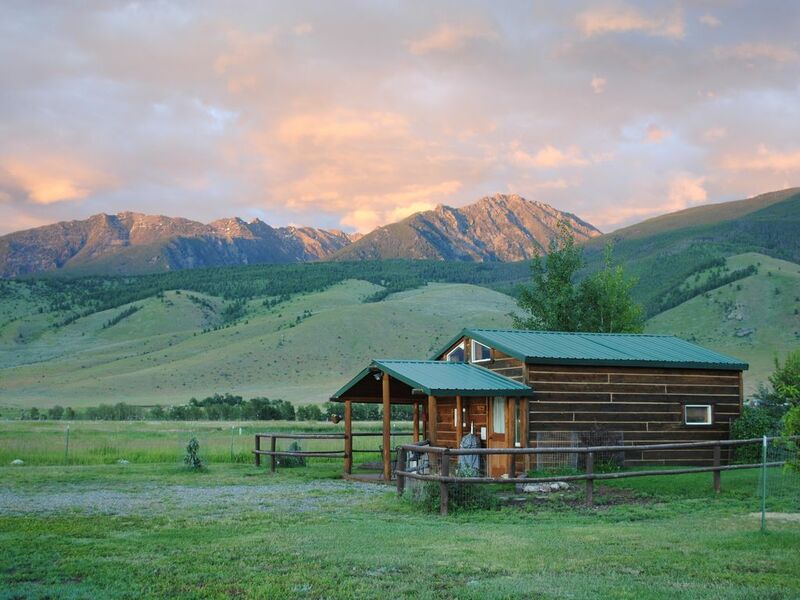 Dexter Peak cabin is perfectly situated on 25 acres at the base of the Absaroka-Beartooth Mountains. This cabin is one of two cabins that we own, the other one about 1/4 mile away on a separate 20 acre parcel on its own which can be rented together or separately. See Elk Ridge cabin vrbo #191225. A 24' camping trailer has been added on the same parcel, but privately located behind our large garage. The RV has a queen bed with new innerspring mattress, as well as two bunk beds, measuring 32" x 72" and the dinette makes into a 4' x 5' bed. The RV is self-contained all on its own with its own campfire pit, bbq, shower, refrigerator/freezer, stove, tv, stereo! The tariff for the RV is $55-100 depending on the month. Just 35 miles north of Yellowstone Park, these accommodations offer breathtaking views of four mountain ranges. Varying lights of the Montana skies and glimpses of nature and wildlife soothe the soul year round. Perfect for creative reflection, a romantic getaway, that special fishing trip or as a home base while enjoying the wealth of activities, breathtaking scenery and abundant wildlife the area provides. The Dexter Peak Cabin sleeps two, has a loft bedroom with a king-size bed and a full-sized, firm quality futon couch on the main floor. Please notice the staircase going to the king-size bed. The ceiling height is between 4-5' above the king bed, one cannot stand up. The cabin has a full kitchen, stocked with the basic essentials, a gas BBQ, television, VCR/DVD with a selection of classic movies, a washer/dryer, and an outdoor firepit located at the lower portion of our property in the draw. A rustic steel fire pit has been added outside the cabin for your convenience, firewood is provided. The cabin sits on the edge of a meadow with its own private yard and covered porch. There is a wrought iron table and chairs and lounge chairs to enjoy the peace and quiet and views of the 11,000 foot tall mountains before you. The door opens to a complete kitchen with hickory cabinets, a full bathroom and laundry area and a cozy living room with television, with built-in VCR/DVD, CD player, table and futon couch. A nice selection of videos and books adorn the bookshelf for your enjoyment after the adventures of the day. A rustic staircase rises to the loft with a king-sized bed. Foam sleeping pads are available for small children. The kitchen is well appointed with a refrigerator, four-burner stove, microwave, cookbooks, pots and pans, dishes, glassware, knives, toaster, blender, and coffeepot and grinder. Laundry soap, iron, ironing board and dryer sheets are provided for your convenience. If you have a larger group, be sure to see our separate listing for the Elk's Ridge Cabin #191225. I moved to Paradise Valley almost twenty years ago for the closeness to nature, and small town friendliness and to live a bit more simply. I met my husband, Gary, at age 39, and married a few years later. And through him, I discovered a new talent in myself with art. We purchased an old log bar/apartment and added a 1800 square foot art gallery and frame shop. Gary is a painter and framer and we are lucky to feature so many friends fine art and crafts. We feel like we are on vacation every day looking at the constantly changing light on the mountains and wildlife in our area with our two Shihtzu's, Kopi and Jessie, our deer-headed chihuahua, Gabe (an angel in disguise), and Buford, our orange cat, a gentle warrior. My mother and brother have moved here from Seattle and are enjoying the sunny skies, mountains and wildlife of the area too. Location is ideal, quiet but close to Livingston, fishing streams and river, intimate view of mountains, close to Yellowstone Park and a few miles from Chico Hot Springs, a favorite for locals and travellers alike! Views of wildlife, mule deer, red foxes, elk, eagles, red-tail hawks and many other birds. The changing light on the mountains, the sunsets, views of approaching storms, quiet and star lit skies are a constant reminder of the miracle of life! We are grateful. We hope that sharing this special spot with you will be a lasting gift for you. Shower, hot and cold water are reversed. Chico Hot Springs is also 10 minutes away, a historic wonderful resort and restaurant with a sparkling hot springs pool with fresh water daily! Watch the deer on the hill above the pool. Pastures with cattle and horses, lots of wide open spaces, and vistas of hills, mountains and benches, rivers and creeks. Not heavily treed except around water. Pine Creek Lodge is 10 minutes away, a quaint little restaurant/store with free outdoor music on many weekends through the Summer. BBQ out on the lawn. Breathtaking views of 3 mountain ranges; The Absaroka-Beartooth, Gallatin and Crazy Mountains. Portable free-standing air cooling unit. Range/oven is 24". Room to roast a smaller turkey. On top of refrigerator. Normal size. Mr. Coffee 12 cup drip, or similar. Wrought iron table and 4 chairs on porch, picnic table about 10 feet away. Selection of popular music, primarily country. Some novels and local books about Yellowstone Park and hiking. Books about Yellowstone and movies for kids. Not any toys. A nice selection of classics and western films, some children's movies. Ask for these if not there. Sometimes we move them around. Dailey Lake and Yellowstone River. Can boat at Dailey Lake, 8 miles away. One can play tennis in courts in Livingston at Sacajawea Park. Public course, 9 hole, in Livingston along the river. Located at Chico Hot Springs, 5 miles away. Many things to do right around the cabin and in Paradise Valley, i.e. hiking to waterfalls, walking, photography, fishing, swimming or soaking, shopping in unique shops i.e. thrift, art or gift shops, western decor, antique. Most everyone wishes they booked longer. Dog-sledding, horseback riding, hiking to a waterfall, soak in hot springs, fish, wildlife viewing, more fishing, see Montana arts and crafts at Shining Mountain Gallery in Pray, bird watch, parasail at Dailey Lake, hunt morel mushrooms, float the river, connect with your spirit!